Last weekend Joe Ranft, the legendary Pixar story man would have turned 50. If you don't know about Joe, Google him and you will be enlightened. 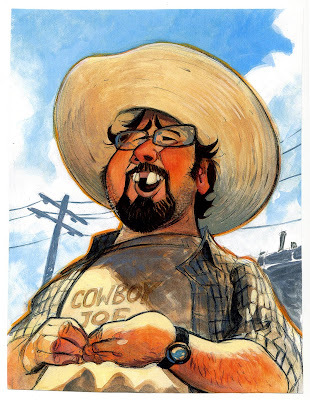 I did this painting of Joe after having worked with him for years on the Cars story crew. It was based on a photo that I had taken of him on a research trip on Route 66. I was fortunate to be able to give him the painting before he passed away in the Summer of 2005. He hired me at Pixar almost 9 years ago and I still think about him every day. Miss you Joe! I bet Joe loved it. Really good painting. Wish Joe was still around. Spud, do you have any acrylic painting books you recommend? I've been itching to learn how. Yeah, I've been dipping my foot into acrylic as well. How do you achieve the 'lineart over paint' look? I assume you place your lines first, but logic tells me they would be covered in paint. I usually start an acrylic painting with thin washes, either a color tone or sketchy blocking of volumes. I use it very thin like watercolors and build it up in layers. Once I have a lot of the values in place, I'll apply the paint more boldly, sometimes chopping a color in around the subject of the piece. I sometimes sketch first in soft pencil (4B) and either use that or a black Prismacolor to reinforce line work if that's the look I want. Hey Steve, do you have some stuff at the Cartoon Art Museum right now? No, there was some Sam & Max pieces there for a Telltale Games event promoting the new season but it all came home after. Thanks Steve, I will give that a try. I do quite enjoy your painting style. Your work on Monkey Island and Sam&Max was a complete inspiration for me and my work since I was a kid, I´m very happy to follow your blog. Congrats for your amazing work.